Why plan a trip to India in 2017? Planning a trip to India is an optimal idea for any season. As you can always travel to one of the many beautiful places in India every month. While the northern Himalayas and the North Eastern Jungles may be popular during the summer, the sandy beaches of Goa , the Palaces of Rajasthan and the temples of Hampi are popular in Winters. India has a lot to offer if you consider its multicultural past. Vacation in India is unique for several reasons. 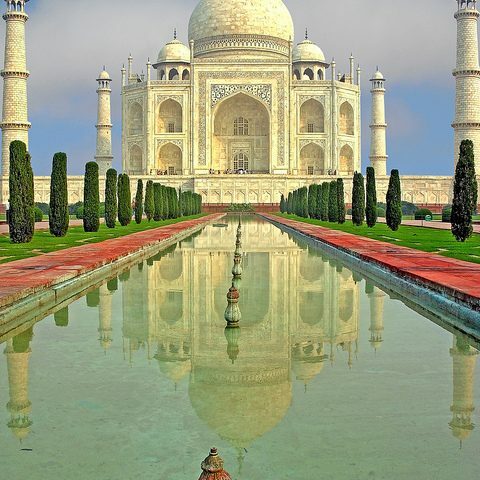 For those interested in a luxury vacation in India, there is the Maharaja express. A luxury train priced so expensive that you need to be really loaded to see India like a King. For the budget traveler, put on your running shoes and practice your bargaining skills. As if your are thinking of saving on a vacation tour, then India is the perfect travel destination. So should I go to India or not? International tourism in India is extremely low. Why don’t foreigners prefer to visit India? With around 8 million visits a year there are many reasons for this. The World Economic Forum considers various factors in determining its Travel & Tourism Competitiveness ranking. From considerations on tourism infrastructure spending and price competitiveness to the cultural fabric and the business environment in the country, the index presents an explicit methodology. India ranks high for Price Competitiveness and Cultural resources and business travel in the WEF Travel & Tourism Competitiveness ranking 2015. While India ranks lower for ICT readiness, Tourist service infrastructure and Environmental sustainability, but the Real Incredible India is outside the cities, where none of these matter. I have always seen a lot of value in India. Rich historical heritage and and an assortment of vegetarian delicacies you will not find anywhere else in the world. But immersed in the path to quick economic development, the country is finally waking up to its environmental problems. The pollution is still confined only to our crowded cities and we still have lush green forests. The Tiger population is reviving and India has now stepped across the path to digitalization. The Travel Economics info-graphic below aims to summarize information on tourism to India. Understanding who visits India may help figuring out the main motivations for travelers. Considering that currency fluctuations can affect your travel budget, the info-graphic below also presents a foreign exchange analysis of the Indian Rupee. The motivation behind this study was to find the optimal time to travel to India considering macroeconomic trends. Considering the economic growth and future rise in domestic tourism, a post demonetization visit to India is 2017 can be a great idea. If you are a person who looks at travel as an Investment, then a trip to India is an undervalued asset. As a tropical country, a visit to central India is ideal for the winters from October to March. If you do land in the Off season, you can still head out to the hill stations which provide a respite in the warm season. Hence , the best time to visit South India will be in the winters. While the best time to visit North India depends on where you plan to go. Rajasthan will be hot in the summers, while the Himalayan resorts are very welcoming. The best time to visit India also depends on the economic trends and reforms. Since 2015, India has changed a lot. The country has adopted digitalization with an attitude unforeseen before. Amid the short term discomfort to tourists visiting India during the currency Demonetization, India has surpassed the challenges and has now become a cheaper place where money is valued more. Cracking down on the black economy can ensure foreign tourists visiting India a more hassle free trip. With more transactions becoming digital, there is lesser scope of being coerced to pay higher charges to unscrupulous agents. Such a major step will be succeeded with a low interest rate regime aimed to boost growth. Rise in Domestic tourism is expected in the medium to long term future. Hence, Now may actually be the best time to visit India. Just like when a smart investor picks up a wonderful stock at a low price, Travel to India post demonetization presents a huge opportunity. Don’t listen to that guy who says do not travel to India because there are lots of rapes and not enough of toilets. Of Course there are places not to go in India. While the South Indian states have very little crime and a high human development index, incidents of crime is prevalent in the lesser developed parts of the country. The nation largely believes in respecting its guests. There is political stability in the country and the government is taking huge steps to curb crime. In Spite of news about crime from India, data for per capita population shows a much lower crime rate. Crime from India is an act of crime from 1 out of 7 people in the world. Of Course you may hear some bad stories, but that is coming from a country with over 1 billion people. So is India safe for tourists? Of Course it is safe to travel to India in 2017. A visit to India is memorable in the countryside. Indian cities are very crowded and the rising pollution is a major concern. Nonetheless, very little of India is still industrialized. A visit to the forests in the North East of India can be a truly enriching travel experience. How safe is the food in India? In today’s age technology can help you with this simple issue. Just visit Zomato and read a review. If a bunch of people are alive posting feedbacks and reviews then the restaurant should be good. Don’t just enter any place you find on the road. Most mid priced places offer high quality food feeding several people everyday. Hot vegetarian food should be chosen if you are entering an unknown restaurant. Try to have bottled water in India. Do not drink water from the tap! Tap water in bathrooms and the kitchen is not safe in all parts of the country. Most Indian houses install a water purification system or just buy bottled water. As a part of your visa process to India, you will have to get vaccinated for precaution. Most importantly, do not take food from strangers while traveling. As a tourist to India you really don’t want to carry too many expensive gadgets and jewelries. This is advice I would give to anyone visiting Europe too. My visiting father was pick-pocketed in Milan and I know at least 10 friends who have faced pickpockets in Barcelona. If you look different, you will catch a little attention. So always be alert and hold on tight to your belongings. Just as tight as you would hold it in European tourist hubs. Seasonality in Tourist arrival trends in India and the west (US and Europe) complement very well. India enjoys peak season during the western off season and an off season during western peak season. India sees a fall in Inflation rates following the Demonetization of large currency in November, 2016 which has led to a stronger rupee. However as India moves into a lower interest rate regime, a rise in Inflation should happend in the near future. With stable Government Debt to GDP ratio and steady Current Accounts, the Indian economy is expected to soar ahead. Indian Tourism may fall lower in Price Competitiveness with an increase in domestic tourism. The advent of the Goods & Services tax (GST) will ensure an efficient hospitality sector and increase India’s overall ranking in the WEF Travel & Tourism rankings. India is currently in a sweet spot with lower Terms of Trade, for foreign tourists seeking a budget travel. Though the Indian Rupee may fall slightly in the coming years, the rise in Domestic Tourism (post reform growth) may make Travel to India more expensive ahead. Taking advantage of Off season travel can be a great idea currently as there is always some place you can visit in every season in India.